Hedge Formula Software - Scam or Not? Hedge Formula Software - Scam or Not? During the past years, there were developed a huge variety of binary programs accessible for traders on the internet. Many of them are quite suspicious. This is why it is recommended to spend some minutes and examine a system prior to making any further steps. Some binary signal programs are well liked, while others can be questionable. Hedge Formula trading system was developed by George Dalio, who is a self-declared expert in financial matters. He claims that he generated his wealth in hedge funds. With his experience accumulated throughout the years, he then came up with the present Hedge Formula trading software. We know that most of our readers would like to find out: is this system a reliable one or it is simply another scam? You can go through our Hedge Formal review to obtain additional info regarding this program. 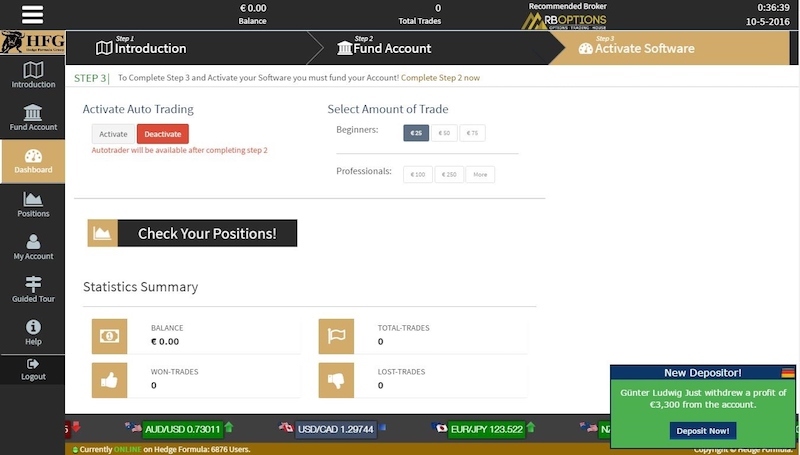 Having its totally automated system, Hedge Formula guarantees its clients incredible profits per minimum deposit. The video from their promotional page claims that the program is capable of generating its clients from $1000 to $4000 per day. It utilizes a complex combination of algorithms developed by George Dalio and his team of experts to evaluate the market changes and info so that to make it easy to forecast the trading signals. Yet, it was difficult for us to find any evidence that Hedge Formula generated any significant earnings. Moreover, a lot of customers have signed complaints related to its general functionality. We think that this application can’t be reliable, as there haven’t appeared any good results or positive feedback from the clients who have used it. As you will find out, there isn’t any fee for the program itself, but you have to start with no less than $250 once you registered a broker. This is typical for the majority of trading systems out there. Once you make the deposit, you can utilize the money for trading. When you generate some profits, you can consider withdrawing the funds so you may enjoy your income. Keep in mind that the withdrawal procedure differs from broker to broker, and you will get a special list with brokers proposed by the trading system. You should always browse the conditions prior to accepting to deal with any trading system, particularly one that is totally new to you. In fact, we could discover only bad opinions relating to Hedge Formula software. A lot of customers reported that their investment disappeared and they could never generate any sort of profit. Moreover, some clients reported that they could never obtain a reply from the trading system’s customer care service. In general, we don’t think that this service is reliable. If you really want to invest your money, look for a licensed service that has some years of experience behind. Final Conclusion: Is Hedge Formula Software a Scam? While we could not collect sufficient details to demonstrate that Hedge Formula is really a scam, we don’t suggest it to our visitors. It’s our position and we think that you can choose from a list of more reliable auto trading programs out there. We recommend that you don’t join this trading service. We don’t want our readers to get deceived or experience terrible situations in which their investments are simply evaporated by a fraudulent system that promises to make you rich. Maybe it works, but we could find only the contrary. Binary Minery review: Hedge Formula Software: 1 stars.